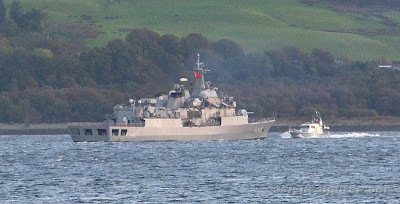 An early arrival back from the major exercise taking place off Scotland's west coast was the return on Wednesday of the Turkish frigate ORUCREIS, and she is seen here passing Kilcreggan as she made her way towards the Gareloch. ORUCREIS is a 'Barbaros' class ship built in the mid-1990s and commissioned in 1997 and is based on the successful German 'Meko 200' class although this particular vessel was built in Turkey with German assistance. She is about to be passed by the British patrol boat SMITER. Last I heard she was still in Faslane, not much repair activity evident. @ Harlux. If you had any knowledge of the history, operations, and capabilities of the Turkish Navy, you might refrain from making funny comments about their seamanship. FYI this is the vessel that is currently lifting stranded citizens of all nationalities off the beach in Libya.